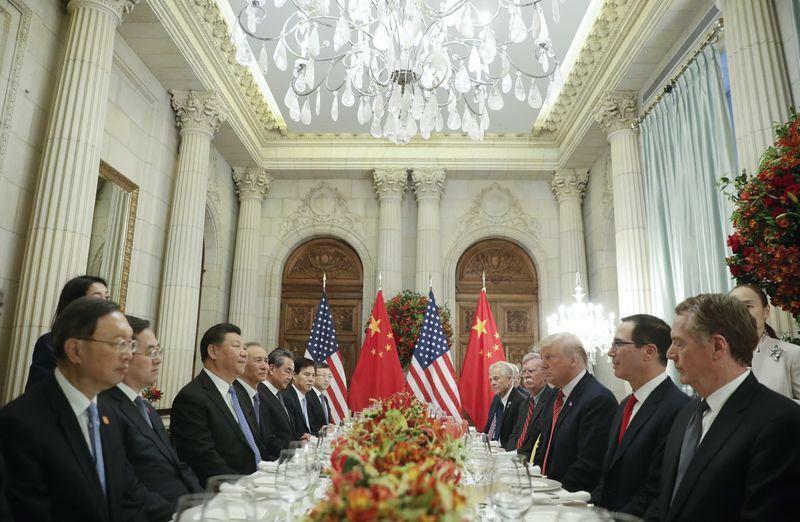 The most important, and much-anticipated dinner date between Trump and Xi in years, which concluded amid loud applause and brief celebrations by both sides, ended in a three-month truce to the ongoing trade war between the two superpowers, with the US agreeing to postpone a planned tariff hike on January 1 and to keep the rate on existing tariffs at 10% for another 90 days in return for greater purchases of American goods. While the arrangement provides breathing space to both leaders as they face slumping stock markets and economic warning signs, and will likely result in a brief jump in the market in the coming days, the two sides failed to make any tangible progress on the fundamental divide and core issues separating the world’s biggest economies. "You blink first!"... "No, you blink first." As Bloomberg recaps this morning, "negotiations have long been stuck over U.S. demands for deep structural reforms such as stopping forced technology transfers, enforcing intellectual property rights and ending state subsidies for strategic industries - all of which China sees as an American strategy to thwart its rise as a global power." It is on these most thorny of issues that there was no real progress during the Trump-Xi dinner. In fact, as Michael Every, head of Asia financial markets at Rabobank said overnight, "I will eat my hat if this means anything substantive" as "neither side is fully ready for the war, but neither side will budge." Despite the lack of material progress on the fundamental divide, the market will cheer that the deal helps to alleviate immediate concerns that trade tensions would further stoke geopolitical tensions, a prospect that has raised worries of a new Cold War. The White House emphasized that Xi agreed to continue pushing for a nuclear-free North Korea, while Beijing said Trump would respect the One-China policy regarding relations with Taiwan -- one of the biggest potential flashpoints between the nations. More importantly, the summit showed that both sides could be pragmatic when needed, and refuted Goldman's bearish forecast that more escalation would be the immediate conclusion. Xi won at least another three months before punitive tariffs on $200 billion in goods rise to 25 percent, allowing Chinese policy makers more time to offset the blow as growth slows. That said, all Xi got was a reprieve, because as SCMP editor Chungyan Chow writes, "Xi Jinping hasn’t really defused the Trump bomb. He just bought 3 month breathing space. Interesting to see what will happen next before the Chinese national congress sessions in March." Trump, meanwhile, got China to buy more American agricultural, energy and industrial goods while still maintaining the leverage of a tariff increase to pressure Xi into making greater concessions on structural issues. China also pledged action to clamp down on the synthetic opioid fentanyl, and Trump said Xi was open to approving a possible $44 billion deal for Qualcomm Inc. to purchase NXP Semiconductors NV if the companies are still interested. So what does the truce achieve? With less than a month left in the year, the one most likely outcome is the greenlight of a strong Santa Rally, both in the US and China, where overnight the China Financial Futures Exchange sent a strong hint to investors to get back in the market by cutting margin requirements for stock index trading to 10% for the CSI300 and SSE50 and 15% for the CSI500, the first such cut since Sept. 2017. In addition to traders, another immediate beneficiary from the truce is the US business community as well as US farmers, particularly those growing soybeans in states he needs to win to get re-elected in 2020. As Bloomberg notes, Trump hailed the “incredible deal” on Air Force One while heading back to the U.S., telling reporters that China will buy “a tremendous amount" of agricultural goods. It is there that little progress is expected absent a material deterioration in markets and economies. Meanwhile, signs of discord continued, and the most notable was the failure to issue a joint statement laying out the framework for talks. Each side gave its own readout of the outcome, and they contained key differences: China, for instance, made no mention of the 90-day time frame, while the U.S. didn’t reference the One-China policy regarding Taiwan ties. China’s omission on the deadline indicates it has reservations on how to handle U.S. demands, according to Wang Peng, an associate research fellow of the Chongyang Institute for Financial Studies, Renmin University of China. Making the type of domestic reforms sought by the U.S. is “extremely difficult as such moves involve the country’s reputation, the party’s authority and the structure of the domestic economy,” he said. But the biggest hurdle and the crux of Trump's deeper concerns with China is found in the 53-page report issued by Trade Representative Robert Lighthizer’s office about 10 days before the Trump-Xi meeting. It accused China of continuing a state-backed campaign of intellectual property and technology theft, downplayed its moves to ease foreign investment restrictions and raised alarm about its “Made in China 2025” policy to lead the world in sectors such as artificial intelligence and robotics. Meanwhile, Chinese officials have repeatedly countered by saying moves to ease rules on foreign ownership of financial firms and automakers show they are opening up to the world, when in reality Beijing is merely looking for international bagholders as China suffered a burst of record defaults which has made local investors shy away from risky local assets. At the same time, they also strictly rule out dropping government support for companies in strategic Made in China industries over fears that would undermine China’s future economic prospects and threaten the power of the ruling Communist Party. The bottom line is that despite much fanfare, the divergence in worldviews makes any lasting solution difficult to achieve unless either Trump or Xi backs down and neither is willing or ready to do so. Still, given the emerging risks to the global economy, and the political costs that entails for each leader, it is likely that both will be motivated enough to concede just enough to keep dragging out the talks without handing the other side a victory. "Growth is going to slow in both countries,” said TCW analyst David Loevinger,. "While it doesn’t remove the the sword of Damocles hanging over trade, having blinked tonight you’d have to guess that the U.S. will blink again in March."